Theresa Caputo has publicly known for her psychic abilities on Long Island Medium, a reality TV series. Before she showed up on the show, Theresa is a medium living in Hicksville, New York, who leaves a huge impression with her bubbly personality and big hairdo. According to what mentioned on her website, she is gifted with the ability to communicate with spirits of the departed. A part of her job is to deliver messages from the spirit world to the living people. If you’ve watched any episode of her show, then you probably know that she has two children, Larry Jr. and Victoria. Updated in 2018, she finally divorced Larry Caputo, the husband with whom she stayed for 29 years. After the first episode of Long Island Medium was aired (2011), the medium soon gained the public recognition. Throughout 12 seasons, Theresa has helped many clients get connected with their loved ones passed away, embraced them with important messages and provided them needed closure. Not only appearing on her own TV series, she also goes on tour and performs a live show in each place she visits – Theresa Caputo Live! The Experience is where she does a live reading for a group of audience. Everything about Long Island Medium is entertaining, but is it true that Theresa really has the capacity of talking to dead people? Keep reading to learn more about the series and the medium herself! What Nationality is Theresa Caputo? How Long Has Theresa Caputo Been Married? Where Did Larry Caputo Jr. Go to College? How Much is Theresa Caputo Net Worth? How Long is Theresa Caputo Live Shows? How Much Does a Medium Reading Cost? We all know her as Theresa Caputo or the Long Island Medium; however, before she became famous, her real name is Theresa Brigandi and was born on June 10, 1966, in Long Island, Hicksville (New York, USA). So definitely she holds an American nationality! She grown up her parents, Nicholas Brigandi and Veronica Brigandi, and has a sibling named Michael Brigandi. At the age of four, she started to feel something abnormal; later her mom took her to Pat Longo and she completely got shocked because she can see spirits. Theresa used to be a married lady. She first met Larry Caputo when she worked at her family’s oil company, and they got married on September 16, 1989. Despite problems in the daily life, the couple had shared a very happy marriage life for nearly three decades. Sadly, this relationship finally came to an end with the separation on December 3, 2017. Larry then moved to LA in 2018 and Theresa revealed that both were preparing for a divorce. They officially finalized the divorce in December 2018. The couple has two children with each other: Larry Caputo Jr. and Victoria Caputo. It was recently reported that her ex husband has already started dating someone new, while Theresa does not let herself get involved in any affair. Her son will turn 26 this year. The Long Island Medium TV show began in 2011, which means Theresa’s son was only 18 at that moment. Now he is definitely not a young boy that you often saw on TLC channel; actually, he has established his own life and things go pretty well. Larry Jr. attended the College of Mount Saint Vincent, a liberal arts college, and he graduated with a degree in media and communication studies. He is currently working for Madison Square Garden Networks Inc. When the Long Island Medium is on air, Theresa Caputo has not only gained fame and become famous, but she has also earned an impressive amount of fortune. So what is Theresa Caputo’s net worth? The Long Island Medium net worth is estimated about $3 millions. Most of her fortune is surely from her work as a professional medium and her hit TLC series. There is no information about her salary, but we all know she can make a decent amount of it. Have anyone taken part in any Theresa’s live show before? For people who haven’t seen the TLC show, I can tell you briefly about the general content: Theresa the medium will visit some of her clients and help them connect with their loved ones. Of course that’s TV where everything can become possible. If you are quite skeptical about her abilities, then why don’t you see her live? Join Theresa Caputo Live! The Experience where Theresa will do a group reading for many people, most are the clients signing up for the reservation on her official website. Make a visit there for a check up on her tour schedule! The length of each live show is approximately 2 hours. Meet her in person and see whether or not she can make anything happen or accurate. Wonder about the price of a reading with Theresa Caputo? There a rumor said that this medium is a fraud as she charges $50 per person who comes to her for a session. In fact, she has no longer performed private readings because she does not have enough time. These days, she usually performs live shows and it costs you just a ticket to meet this incredible medium. 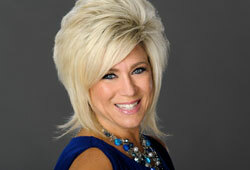 Depending on the zone, the Long Island Medium prices start at $39.75 plus ticket fees. When I went to her live show in _, the ticket price ranged from $65 to $125. Guess what? More than 2,000 people came to see the woman known as the Long Island Medium, whose TV show on TLC keeps going strong with the 12th season in 2018. Why did the medium get cancelled? After Theresa’s appearance on ‘Windy City Live‘ talk show, her fans and followers felt a bit annoyed because they think what she said is not convinced enough; once again, the validity of her gift is doubted. But overall, not everyone is putting hatred on her reading. In general, you will love this lady after receiving her words of wisdom. She is effervescent, caring, inspiring, and very sweet to her fans. Her genuine guidance will help you find closure to any situation you are getting stuck in and re-connect with your loved ones for beautiful messages. Additionally, her Long Island Medium show on TLC is worth watching as it’s very meaningful, touched, and entertaining. For more info about Theresa, contact now! He is the 59-year-old husband of the Long Island Medium, Theresa Caputo. He also appears on his wife’s TLC series alongside with his children Victoria and Lawrence. Before gaining the recognition from people, he played hockey for over 25 years and coached his son’s hockey team. At the age of 55, he decided to retire when sold his imported food business. In the article regarding “How old is Larry Caputo,” we are going to discuss more about this interesting man. Married Theresa in 1990, Larry has happily lived with his wife for 22 years. He enjoys various kinds of sports and is a huge fan of NY Rangers team. Also, he is a motorcycle enthusiast and considers his bike as his second wife. He loves Theresa just the way she is and would not do or change anything about her psychic power gift. While the woman is out making a career of healing people and sharing their stories, what does Larry do for a living? Interestingly, on an episode of ‘Long Island Medium’, he expressed that he wants to start a business where the clients can have their loved ones’ ashes dyed and turned into sand art. Really, it does not look like his new venture has taken off quite yet. But if he decides to make his idea a reality, he’s got years of entrepreneurial experience to help guiding him. Well, meet Theresa Caputo’s husband and you will discover some of his great stories as well as understand this man more. At the time the TLC series premiered back in 2011, Larry was already retired. Early in the first season, by staying home all day, he successfully drove Theresa crazy. He was seen cleaning up some choppers at a local motorcycle shop, but it has no evidence whether that was for business or just one of his pleasures. Shortly after a period, he created Big Larry Apparel, a clothing company, with the goal of combining his love for tattoo art, fashion, and motorcycles. For the most parts of the show, it turns out that Larry loves spending most of his days empty-nesting with his wife by going to arcades, trading lives for a day, and commissioning a portrait of the duo – just like the ‘usher’ for middle-aged couples. But as we all know, being a reality TV star is enough work in and of itself. Do you think Larry also connects with spirits like his wife, Theresa Caputo? Does the Long Island Medium give him information? In an interview with Inked Magazine, he said that it’s hard to read somebody that you know everything about. His wife may not read him yet always offers him advice. They both have gone through almost the tragedies of the large part together to begin with. He believes that every individual does have the spiritual connection; it’s just that some have a higher level than others. At first, he thought that no one needs a medium to connect with their loved ones, but now he’s so much more aware of it from being around Theresa and witnessing her gift for so long. Looking for one free psychic readings no charge? Can you make an appointment with Larry Caputo’s wife, the renowned psychic on Long Island Medium, for a spiritual session? Theresa Caputo is probably one of the most famous psychic mediums in America currently. Not only having her very own reality show, she also holds many live performances and is the author of several best-selling books. Claimed to be able to communicate with the dead, she’s helped millions of people connect with their loved ones in spirits. According to what she has told on her official website, Caputo has been a practicing medium for more than a decade. Would you ever go for a free over the phone psychic reading with Theresa? When she reached her 20s, Mrs. Caputo firstly met her teacher, Pat Longo, who is also a spiritual healer. That person guided her to learn and practice of how to channel spirit through chakras and release it with words. Later, she began her career as a psychic reader by doing reading for plenty of people and recording every experience on the TLC program. Of course, there were many rumors about her fake readings; however, Caputo has shut down all of them. It’s reported her recent separation from her husband doesn’t affect to what she is doing, even though it may slow her down a bit. She performs multiple readings on each episode of her show and travels across the country to do readings for a couple of lucky fans. These days, it’s really tough to get a booking with Theresa Caputo. How much it costs you a reading with Theresa? Simply sign up as a member on her website and your name will be on the waiting list, but keep in mind: Caputo already had a two-year waiting list even before her Long Island Medium show was published. This means you have to wait for a very long time. But, with a private chat, you can tell her any of your pressing issues. If you are trying to conceive a baby, the psychic will give you a pregnancy prediction to let you know when you will become pregnant. You totally have a chance to feature on her TLC show. The participant will get picked from the waiting list based on 3 factors: location, availability, and no pressure when appearing on television. If you are able to be on the show, you can witness how Theresa Caputo avails her psychic power so that you can determined whether you should purchase a more private session from her. It doesn’t like other free psychic chat provided by psychic networks nowadays. If you don’t feel like waiting, then a group event may meet your need. Caputo’s tour regularly takes place in different cities around the country – each place will have a different ticket price point. While some cities sell tickets at a low price of $40, other places come with the higher-end tickets at about $120. Get one ticket and you may receive her live reading in the middle of the show. Ask us anything about the topic “how old is Larry Caputo” if you have any question.